MAILS FOR 1 oz. RATE! 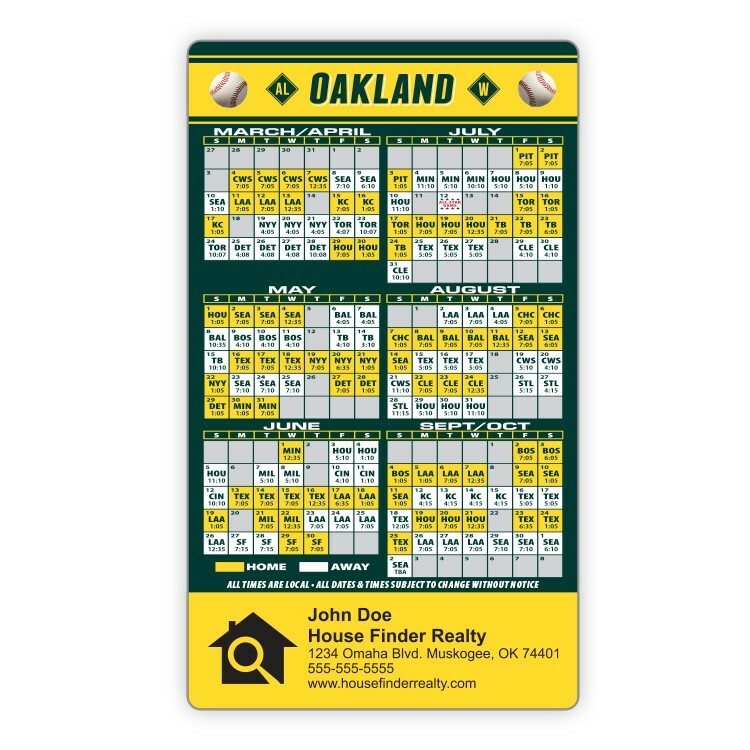 Available with the schedule of any pro baseball teams, you can have an instant imprinted gift item for trade shows and sales meetings, or use for sales calls and prospecting. Rectangle Magnets make a beautiful product to give to your customers. 3.5 in. x 6 in. Price includes printing in full-color (four color process) on one side, choice of stock schedule. Exact color matches, metallic and fluorescent colors not available in full-color. Magnets are not intended for outdoor use. Write-on/Wipe-off surface not available. Custom schedules are billable at $60(C) per hour. PLEASE NOTE: Dates and times on all schedules are subject to change without notice. Schedules shown online may not represent actual current schedules and are intended to show color, theme, fonts, general layout, etc. of stock schedule. Schedules will be updated as current season approaches. Schedule date and times are taken from official websites of each sport and are subject to change and availability of the individual professional sport scheduling system. Our stock schedules ARE NOT endorsed by any professional sporting organization/team. Various schedules may include TBD's for game and/or times when order is received 3 weeks prior to opening game week.